Keep the umbrellas, rain jackets and galoshes handy. The extended forecast in upstate South Carolina is for rain, more rain. And then, more rain. So much water may fall that flash flooding will be a concern, forecasters at the National Weather Service Greenville-Spartanburg office said in a special weather statement Sunday. There will be a lull in the rain Monday, before another storm system moves in from what has seemingly been a parade of systems Tuesday. This is consistent with the forecast for above normal rainfall this winter due to the El Nino pattern that has developed. A weak front slipped south of the state this weekend, temporarily allowing drier and cooler air to filter in from the north. However, this same front is expected to waffle back and forth from south to north the entire week as a series of disturbances move along it. Each area of lower pressure will bring with it the risk of rain, and some of it could be heavy at times. This will be especially true in the upstate region of South Carolina where the moisture and upper-level winds will coincide with the higher terrain to maximize the lift in the atmosphere. 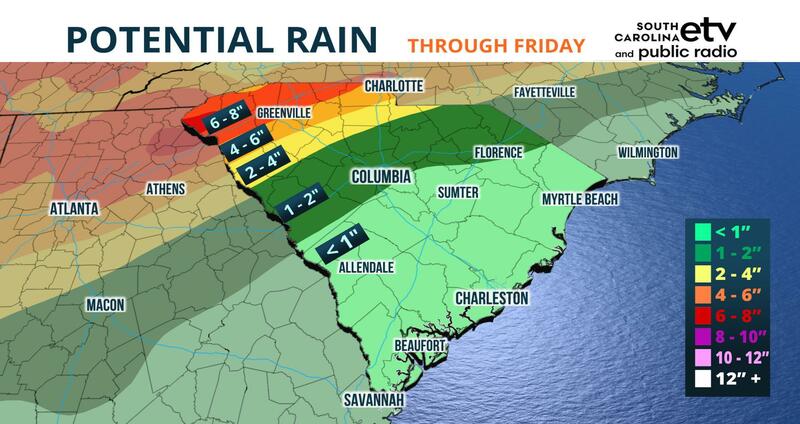 Rainfall amounts through Friday will vary significantly across the state, ranging from potentially more than six inches along the I-85 corridor from Anderson to Spartanburg, to less than two inches across the Midlands of South Carolina near Columbia. 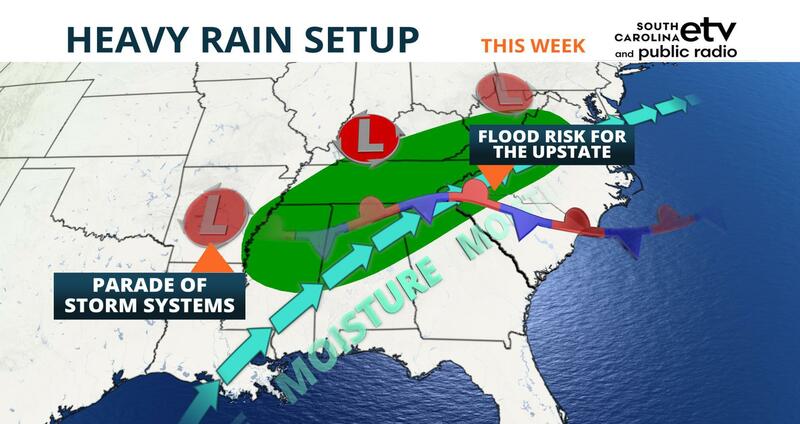 The heavy rain event will not just be confined to South Carolina. In fact, much of the Mid-South will experience heavy rain for several days this week due to a similar setup. The National Weather Service alluded to this last Friday, posting this rainfall forecast on Twitter showing the extent of the potential heavy accumulations. Nature's faucet may not shut off for parts of South Carolina until the following weekend. Long range forecast data suggests a stronger storm system and cold front may finally be able to push the moisture out of the Palmetto State by next Saturday or Sunday. Until then, residents in flood prone areas where the heaviest rain is forecast are encouraged to stay informed of the latest forecast and listen to local authorities if a flood warning is issued.